Sas Bator Colonnas is a multipart singing group from the Scano di Montiferro, a mountainous region in central Sardinia, Italy. Antioco Milia, Antonio Carboni, Stefano Desogos and Francesco Fodde started singing together in 2002, carrying on the vernacularmultipart singing practice, one of the most representative cultural forms of their village and their island, which is performed by four male singers and called cuncordu. The Sardinian word cuncordu refers to the concept of “harmony” between the singers (that is not only “musical” – singers also need to get along to sing properly). This word defines both the musical style (a cuncordusong) and the group of singers (the cuncordu). This singing practice is particularly characterized by the special vocal sound techniques used by the parts. The two lowest voices produce a peculiar guttural timbre created by the distinctive use of the resonance of the oral and nasal cavity. The cuncordu singing is currently the most practiced musical activity in their native village of Iscanu. Usually, singers perform in different contexts related to village social life, for private dinners and parties, weddings, community and religious celebrations in honor of the Christian saints, and ritual occasions like the procession of Holy Week, before Easter. On these occasions, singers perform a repertoire of different songs with fixed melodic, harmonic and rhythmic parts. The songs are sung with different traditional lyrics generally using Sardu, the indigenous language of Sardinia, except for the Holy week songs, Miserere and Stabat Mater, that are sung with the original Latin text. Repertoire includes songs related to convivial moments, to the Catholic faith, or others that are strongly tied to and accompanied by local traditional dances. Currently, cuncordu singing is done by middle-aged as well as younger men and in different village social events. Cuncordu Sas Bator Colonnas represents the youngest generation of singers from Scano di Montiferro. They have sung on multiple occasions for social gatherings and religious rituals in their village. They have also performed outside Scano di Montiferro and all over Sardinia, in both performing and teaching capacities, including televised broadcasts, workshops and seminars related to multipart singing. Beyond southern Europe, they have performed in Belgium, Spain and Germany, all the while maintaining strong ties and performance commitments in their natal village. 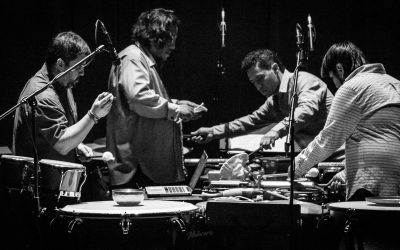 In October 2012, they released their first album, “Antigos Trazos”, the result of years of careful study and performance of the local form of multipart singing. In this album, we hear all their love for this music and the strength of the ties that bind them to it. They continue tirelessly in their practice and expressive research, sure that this can be useful for future generations of singers and music lovers in Sardinia and around the world. Their love for this music, and the strength of the ties that bind them to it, are apparent in the new album, and they continue their tireless practice and expressive research with the confidence that keeping this music alive can be useful for future generations of singers and music lovers in Sardinia and around the world. The event on November 16th at 7:30 p.m., which is the U.S. debut for this cuncordu, will be a unique lecture-performance, which will be mediated and translated by multipart singing specialist Diego Pani. It coincides with the annual meeting of the Society of Ethnomusicology (SEM) which is convening in Albuquerque this year.